The name of the piece that appealed to me most was Snap Roll. Created by Dean Fleming in 1965, it was achieved by using acrylic paint on a canvas. This is not a design piece so it does not have a practical purpose of use. 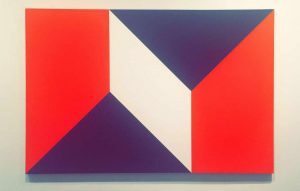 The message behind this work is conveyed through the artist’s use of seemingly simple shapes to allow viewers to ultimately feel a combination of disorientation, astonishment, which he hopes will lead to enlightenment. 4) What appeals to you about this design/art piece? Why? This piece of art appealed to me because I love clean lines and geometric shapes and this work encapsulate both of the previously mentioned. 5) can you make a connection between this piece and the notion of “fake/authentic”? When first viewing the piece many only see shapes, however, it is much more. The artist’s ability to evoke feelings based on something that hasn’t directly affected someone is ultimately is a fake emotion. The work Bookcase was created by Andrea Branzi. 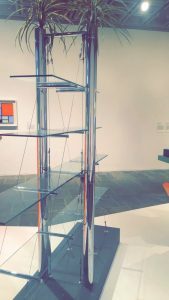 Worked on from 1980-1989 it is a design piece constructed from glass, metal, and plastic. The piece does not necessarily solve a design problem but it is, however, a functional piece that can be used for book storage. 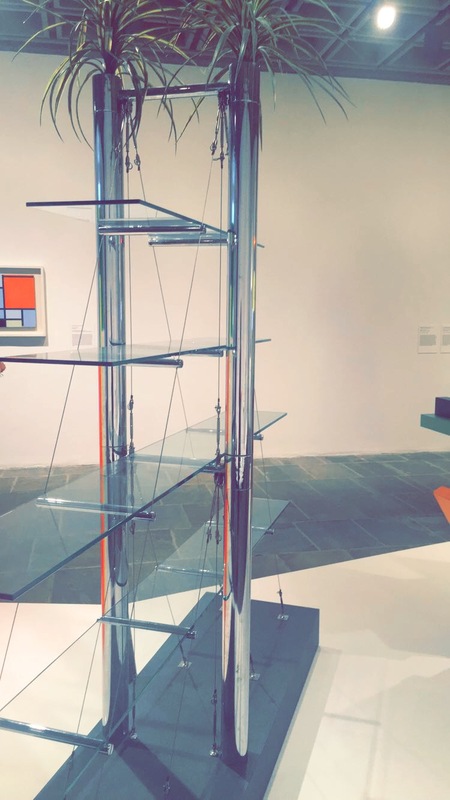 This is a design piece, not an art piece. This piece appeals to me because of the crisp, clean, minimalistic design. The overall simplicity gives a refreshing renovation to what is commonly known as the quintessential bookcase. This piece fits the fake criteria because at first viewing one would think it is a sculptor of sorts. However, the reality that it is a bookcase is almost hidden so the piece gives off a fake facade.